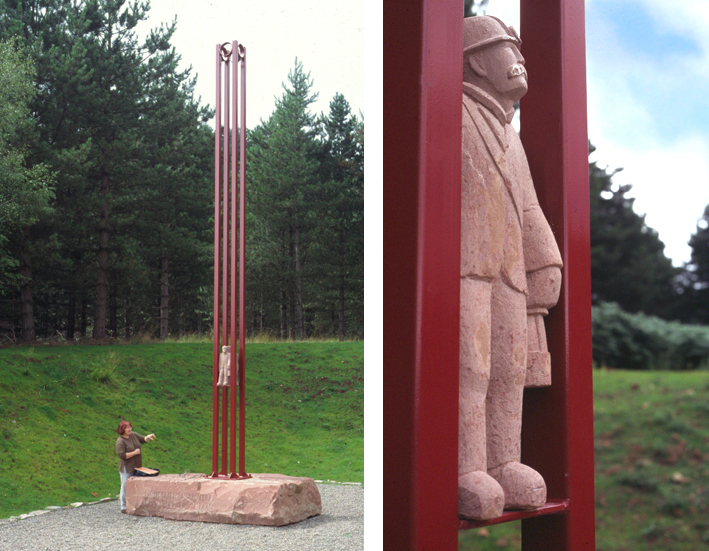 The sculpture has an overall height of 8m comprising a steel tower of four lengths of 80mm box section, painted red, fixed to a quarried slab of local red sandstone. The tower is meant to evoke a sense of the deep mine shaft, with a small, 250x400x700mm carved group of miners set within the shaft as if descending in the cage. There are four steel rings fixed to the top of the tower to represent the pit top winding gear. The lettering carved into the base reads ‘NORTHERN UNITED LAST DEEP MINE OF DEAN’. The steel work was fabricated, painted and installed by Remnant Engineering to Phil’s design.